The Vicar, the Associate Minister and the Reader are always available to conduct funerals of parishioners. This can be at a crematorium or in St Barnabas church before a burial at Woodwells cemetery. We offer support and encouragement during this difficult time. Normally the initial service arrangements are dealt with through the funeral directors however please contact the vicar if you have any questions at any time to help if you need clarification about how we can help. 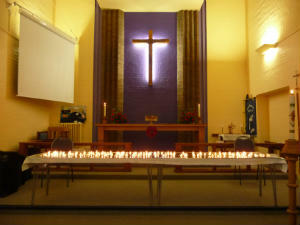 Once a year we have a Bereavement Service for those who have died in our Parish. Everyone is invited to light a candle for someone who is special to them but is now no longer with us. This is generally near the end of October. Please see the Notice section for further details nearer the time.